I am a birth and postpartum doula serving Connecticut. I provide emotional support, physical comfort measures and information before, during and after the birth of your baby. The birth experience is one that you will remember for the rest of your life. It’s important to pick a doula that you and your partner feel comfortable with. I will meet with you, and anyone else you want at the birth, in-person, to see if we are a good match. Once we decide to work together I offer 1 – 2 in person prenatal visits. Work with you to create a flexible birth plan that everyone feels comfortable with. I am on-call for you, 24 hours a day, in the lead-up to the birth to answer questions and support you. When you go into labor, I will be at your house or the hospital within 1 hour of your call. I am happy to come as early as you feel you need me. I stay with you during the entire labor and provide emotional and physical support to you and your partner. I am also happy to take photos. Once your little one has arrived, I will make sure you are comfortable and get you started with breastfeeding. I’ll then come back to check in with you in the next day – 3 days. 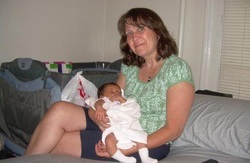 Read more about what a doula does on my "Ask Denise" page. I am available to attend births within an hour of my home in Terryville, CT. Check out my line of natural care and herbal products at Essie’s Garden on Etsy. My fee as a birth doula is $900. I ask for a $100 retainer at the time you choose me and that we work out a payment plan that works for you at that time. Generally, I ask that the remainder be paid at our prenatal visit around week 35. This will secure my on-call status for you. However, please do not let finances determine whether or not you have a doula present at your birth. Every woman should have the support she wants and needs during birth. Together we can work something out and if I cannot serve you I will do my best to help you find a doula who can work with you. Pricing for Postpartum support depends on the services and timeline and is generally paid by the hour.